When Left circumflex is as big as left main . . . LAD envies ! Human coronary artery branching pattern is unique in every individual . Left circumflex shows many variations. The important ones are a separate origin , variation in the angle of bifurcation, the number of OMs .Further, the length of mainstem LCX and its course in the AV groove are quiet unpredictable.The diameter of LCX vs are generally equal (or LAD >LCX). The division of left main is such that circumflex generally gets a lesser share of blood flow . If LCX is dominant this ratio may be little balanced. But if the LCX is huge LAD definitely suffers ! When left circumflex equals the size of left main the pattern is distinctly unusual. This patient we encountered recently had 4mm sized LCX and presented with a tight LAD lesion . This man's LCX probably will never sufffer from atherosclerosis ! Narrow ostiums are prone for atherosclerosis .A large mouthed LCX rarely involves in left main bifurcation lesions. Disproportionate size of LCX when compared to LAD can have hemodynamic implication of provoking LAD disease . The implication of differential sharing of left main blood flow is not fully understood .It needs further insights. 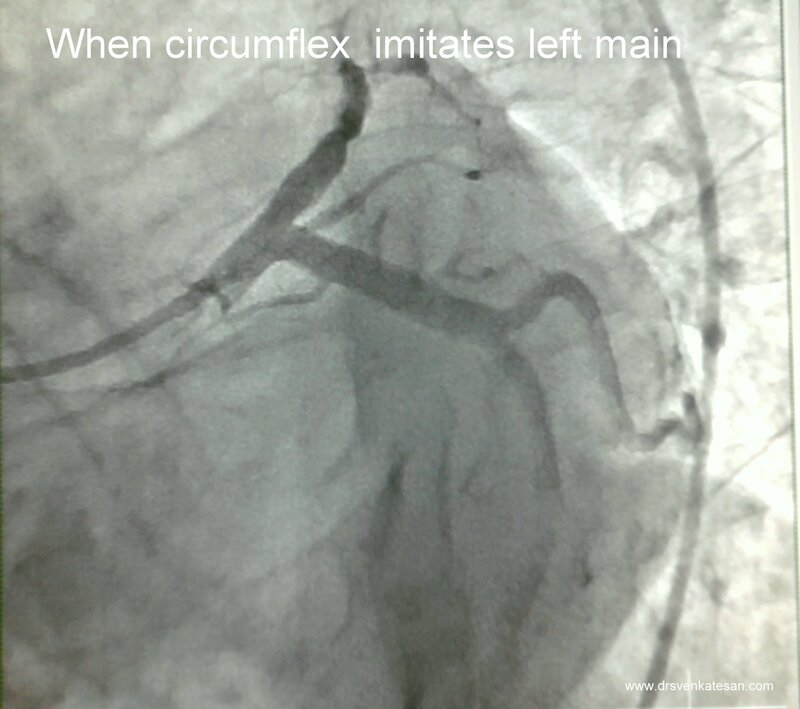 Don’t panic when you diagnose a left main disease in routine coronary angiogram : It may cost you a life ! 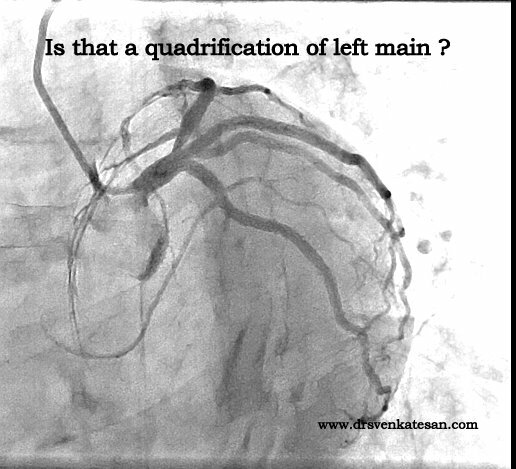 Left main coronary lesions are fairly common during routine coronary angiogram.These may be a critical or a innocuous lesion.The word “left main” triggers a sort of alarm reaction to many cath lab staff as well as the cardiologists and surgeon.Many times, these left main lesions are detected in patients with chronic stable angina who have stable symptoms. Left main disese has not been graded clearly in literature . Often it is perceived , any lesion in LM is serious. There is an unwritten rule, rather a medical compulsion to take a patient with left main disease for emergency CABG ( Now some centres ,emergency PCI) .Some institutions make it a rule these patients are posted in the next available slot in the theatre. The basic question we raise here is “Should we consider all left main disease as an emergency”? Not really , especially when it occurs in a stable angina .One can wait , buy some time to fully evaluate and prepare the patient and may be the patient can be posted as an elective case. It is a well recognised fact that, CABG carries adverse outcome when done as an emergency procedure. This is primarily due to inadequate pre op work up and resultant complications. It is also well known , surgical back up team may not be available in full strength in odd hours . This post is to convey the message , that left main is a serious disease but that doesn’t mean it should elicit a panic reaction and be taken as an ultra emergency . There has been many morbid and fatal outcomes in many hospitals due to this apparent pseudo emergency ! Note* 1.Left main disease during acute coronary syndrome is to be seen in different perspective.2.Some of the proximal LAD lesions are so tight and could be more significant than left main lesions.